Without fuss, MAGIC THAT WORKS. It puts you in IMMEDIATE CONTROL of every situation. 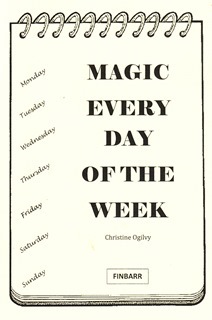 Here is a unique programme of day-by-day magic spells devised by life-long occultist Christine Ogilvy. EACH MAGIC SPELL TAKES ONLY MOMENTS TO PERFORM, EACH DEALING WITH WHATEVER PROBLEM  OR WISH  THAT YOU WANT SOLVED OR GRANTED, one day at a time! Spells for everyday matters as well as the more serious. This is a practical programme which can be applied immediately  for use every day of the week! Whatever is uppermost on your mind on any particular day a spell is here to deal with it! Why fret and be anxious when you can have a magic power on hand  a power that gives you a thrilling sense of control  rather than merely being at the mercy of circumstances and other peoples whims! dealing with officialdom and authorities. excelling in your chosen sport. remaining calm when under pressure. Never has magic seemed so easy! Magic without fuss. No summoning of spirits  only the power of your own subconscious mind which these spells activate. Practical, to the point  effective!